My startup application is a Windows Forms application (.net 4.0, x86). 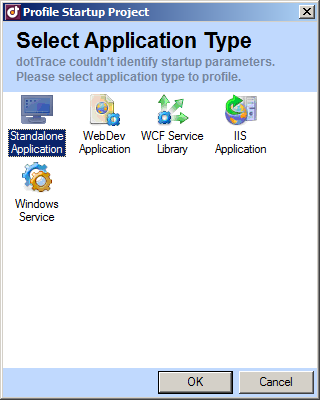 Using the 'profile startup project' menu item starts dotTrace with the selection dialog and the message "dotTrace couldn't identify startup parameters. Please select application type to profile." (see image below). I'm using VS2010 under Win7 x64. Why can't dotTrace recognize my project? Any more info needed? Anyone had this before? Hi! Could you please send me (alexandra.rudenko@jetbrains.com or support@jetbrains.com) a sample solution on which it's reproducible? We can subscribe NDA if necessary.